Our group mission was to fund raise $500 for a community partner of Spanish 332. Patrick, Emily, Kat, and myself met up various times to devise a fundraising plan and discuss what community partner we wished to support. The choice was difficult because all of us volunteer for separate organizations such as ECIRMAC, Crisis Nursery, the International Academy, and Prairie Elementary School’s dual language program. All of the partners could benefit from the donation. Who has the most immediate needs? Before we decided on our community partner I attended a CU Immigration Forum retreat where I met the Urbana School District Latino parent liaison Lucia Maldonado. She gave a presentation on the situation of unaccompanied migrant children in the Urbana schools. Several unaccompanied minors traveled here from Central America on their own due to uncontrollable levels of violence and poverty. She explained that many of the students were in need of a lawyer and the funds to pay for legal representation and transportation to Chicago for immigration proceedings. According to Politico, 9 out 10 child migrants subjected to a removal order or voluntary departure did not have a lawyer. The 7 out of 10 children who did have a lawyer won the decisions allowing them to stay in the United States. 80% of child migrants in Illinois do not have a lawyer. Many of these children qualify to stay in the United States under asylum and temporary juvenile visas. I brought this news to my group and we all decided we needed to something on a local level and raise awareness and money - fast. All of the funds raised would subsidize the students’ legal representation and transportation to Chicago for immigration proceedings. We also decided to focus on educating our campus and C-U community about who are unaccompanied minors and the challenges they face and overcome. All of the students attend school where they receive most of their meals and support. Many of them work after school till late hours in the night. Therefore, we wanted to express our support and solidarity as they attempt to receive asylum relief or other legal forms of status in the United States. So we fundraised. A lot. Instead of raising $500, we raised all of $4,434. Essentially we divided our fundraising process into two stages: spreading awareness and raising money. Stage one was spreading awareness. For this we held two puppy-chow sales in the foreign language building. At each sale we handed out sheets, alongside the puppy-chow, which informed our customers on the current issue regarding unaccompanied minors in the area. In addition to being aware of the issue, we wanted people to also be aware of what was going to be the foundation of our stage two: movie screenings. So in order for there to be a large turnout, we printed fliers that advertised the screenings and handed them out as well. All in all, the puppy-chow events allowed us to shed some light on the issue and advertise our major events – while still raising money towards the cause. 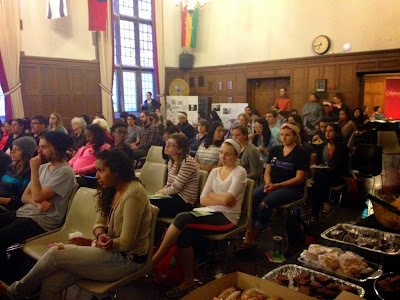 A few weeks later, in collaboration with CU Immigration Forum, we held our two movie screenings. Each one showed the documentary Which Way Home. We thought it was important that all members of the community had the opportunity to attend. 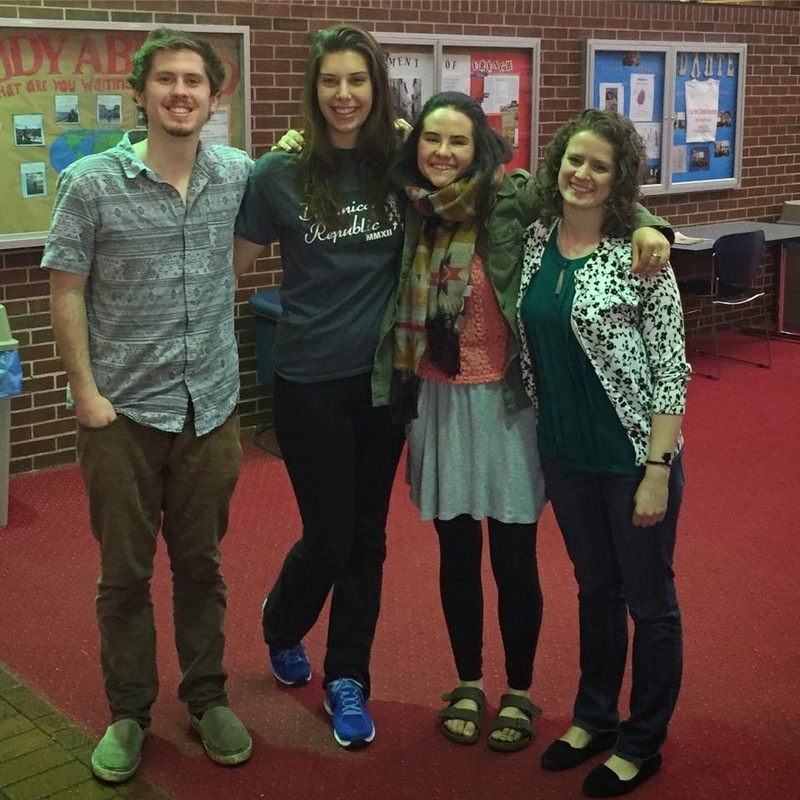 Therefore we held one on-campus at the University YMCA, and the other off-campus at Urbana High School. After reaching out to local companies, we were fortunate enough to have a number of community donors. We served food items from Rick’s Bakery, El Charro, Café Kopi, Common Ground, Maize, and generous families in the Urbana school district. We were even a part of a solidarity walk with CU Immigration Forum and la Casa that took place before the Urbana screening. 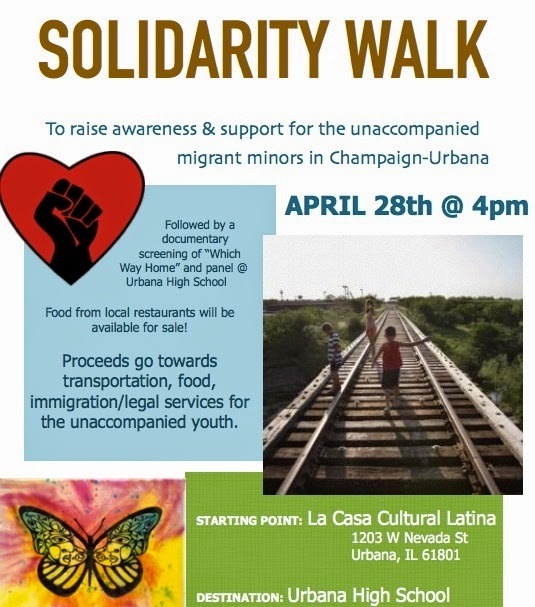 Several students and community members walked from campus to Urbana High School in order to raise more awareness for the unaccompanied minors. On the whole, our efforts were well rewarded, and we achieved more than we ever thought. Now it’s time to use the money and awareness that we raised to assist the local unaccompanied minor population. In terms of the difference that our money can make, here is a breakdown of what could come from the money we raised: With the $4,434 that we raised, we could help CU Immigration Forum provide 443 healthy lunches or 177 legal consultations or 88 Greyhound bus tickets for the children to attend legal proceedings in Chicago. In total we can help provide all three of these necessary services for 52 minors who desperately need the resources that give them a chance to stay in this country. So far we know of around 30 local students who need these services, meaning we are able to continue to provide to those children who will arrive unaccompanied in the future or provide even more assistance to those who are already here. Our contribution to this cause goes beyond monetary support as we were also able to raise a lot of awareness for this issue by promoting our events and talking with community members on social media and in person. This increased community knowledge will mean that others may want to continue their support for this population and spread knowledge to others in the community who can donate their time and money to supporting these kids. Hopefully this can lead to a sustainable system for aiding unaccompanied minors who come and stay in the community both in the immediate future and long term. With our extra money and awareness, the community may also be able to begin preparing for the future needs of these children and those that are still arriving instead of having to react to problems as they arise.